One of the biggest challenges with online shopping—whether it’s for a pair of jeans or new sneakers—is knowing how something will fit you. And surprisingly enough, this same pitfall applies to watches too. As you browse online, here are the key sizing and fit points to keep in mind as you shop for the perfect fitting watch. Modern tastes have gravitated towards watch styles with a larger case. For women, a standard watch case measures 26-29mm and mini watches are typically 23-25mm in diameter. For men, the average watch is 37-39mm; a sports watch is 40-42mm and over-sized watches measure 45mm and up. Some wearers will argue the case sizes have grown too big—others love the weight and impressive size of an over-sized watch case. Ultimately the “correct” size comes down to personal preference and which size feels most comfortable. Case thickness is an oft-overlooked but incredibly practical consideration when shopping for a watch. For instance, if you typically wear a suit to work, a thick case may bunch up or stretch out your jacket sleeve. In that instance, a dress watch with a thinner case may be a better option. Factor in the pieces from your wardrobe that you would most typically wear with your watch and decide if a bigger watch will pair well accordingly. Watch lugs are the metal extensions where the watch case attaches to the bracelet or strap. These lugs are not factored into (and actually stick out further than) the case diameter’s measurements. That said, when measuring your wrist for which size diameter you prefer, leave breathing room for the lugs which will slightly elongate the height of watch. You do not want a watch where the lugs extend out over your wrist as it is uncomfortable to wear. The width of your watch strap or bracelet will depend on the case diameter and lug width, namely the larger the case diameter, the further apart the lugs, and the wider the band. You are pretty beholden to the band width as it needs to fit the lugs’ spacing. However, you may be able to swap out bracelet the style by, for example, subbing a fabric strap for a leather one of the same width. 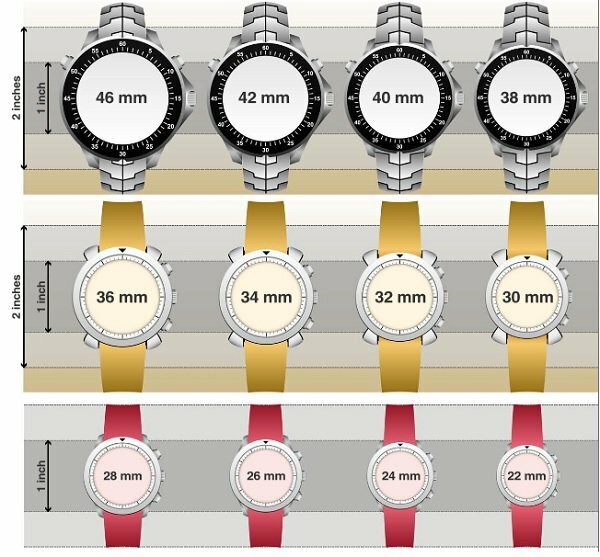 Awesome guide, one should follow this when buying a watch.